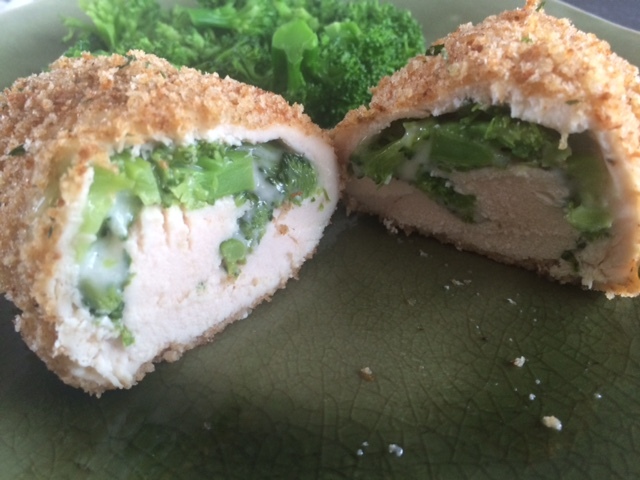 Broccoli and Cheese Stuffed Chicken | Om nom nom! I’m always on the lookout for interesting ways to cook chicken breast – a) it’s kind of boring on its own, and b) I’m not fabulous at most methods of cooking it. But this came out quite well, wasn’t dry, and was great for leftovers – just the right size for lunch. You could really use any vegetable and cheese you wanted with this – I did broccoli and provolone. Very low cal and easy. I got this from Skinnytaste. Preheat oven to 350°. In a small bowl, combine egg, water and a little salt. Beat with a fork to make an egg wash. Set aside. Fill a second bowl with the breadcrumbs. Slice chicken breast halves into thin cutlets, and pound them to make them thinner – this helped me roll them. Season chicken with salt and pepper. Cut each slice of cheese in half. Place a 1/2 slice cheese in the center of the chicken and top with broccoli. Wrap chicken around to completely cover cheese, using toothpicks to secure. Dip chicken into egg wash, then breadcrumbs. Spray cookie sheet with oil and place chicken on cookie sheet. Lightly spray chicken with oil and bake about 25 minutes, until cooked. This recipe can be doubled, etc. very easily.